The guiding days have been very good with days filled ,of fish landed and lost. 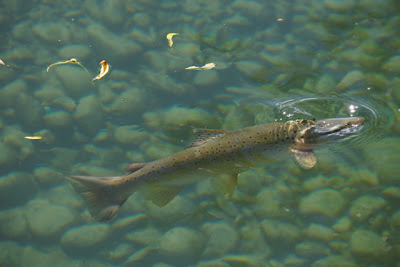 The main rivers in the area have been fishing great despite the low water, feed by spring creeks they are cool and the browns most of the times have been exploding into the air, like rainbow trout. Yesterday I worked with a fly fisher from Switzerland who had been struggling to catch any of the browns in the South Island. He had been in the North and caught plenty. But the South was beating him and he was starting to beat himself. But he was honest and realized his casting was not up to fooling some of these browns. He had been fly fishing for 5 years and is in a club. We ended up spending nearly the full day in the casting area and gradually I managed to turn him around as he was a very quick learner and ironed out his faults very quickly. We ended up on a small local river for 2 hrs at the end of the day and in that space of time he hooked 7 large brown trout. 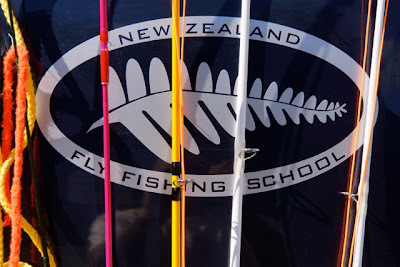 He was ecstatic and it goes to show what help a day at a NZ Fly Fishing school can do for some and a wee bit of local knowledge. 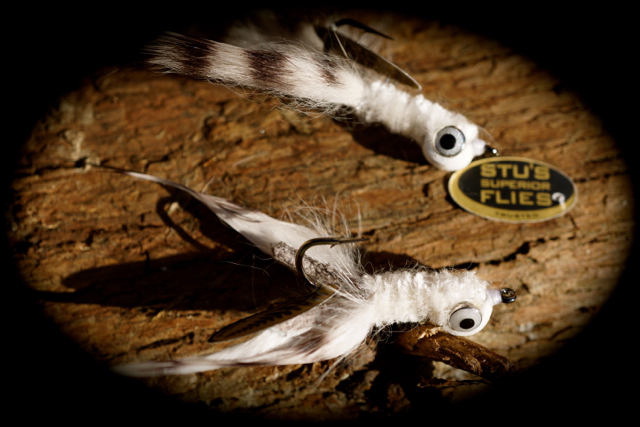 New sizes of my saltwater flies available Now! The shop has been very quite in the past two weeks with not many fly fishermen or tourist around. Three days three customers, so we now have a press the bell system on the door of the shop. This way office work can get done at the same time. So if you are passing and see the door closed but the flags out it means, we are always open. Just press the bell and we will be there to serve you with a smile. It seems many people are getting ready for a saltwater trip over the NZ and Australian winter. As we have received many emails regarding orders for the Superior Saltwater range of flies. In 16 yrs this has to be the most calm weather wise season I have ever had. Especially no wind!! Yes, nearly every day there has been no wind. Yes, not much rain either and now in my small town. I hear that 4 of the houses have run out of water, some for the first time ever! There will be a new newsletter bing sent out in the next day or two, which I'm sure you will all enjoy. If you want to receive the latest Stu's news - It's very simple and only takes seconds - click here. THE NEW PILLOW FLY ? 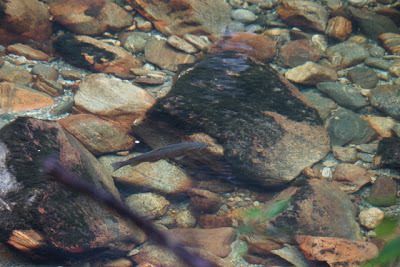 A Huge fish ,just waiting on a Chartreuse Willow Grub, How clear is this water, photo taken from over 100ft away. Also great feed back has been coming in from all over the world about the success people are having using my designs. One that caught my eye was a gentleman from Brazil who had been fishing in Fiordland and had great success with my chartreuse willow grubs - this was strange I though as there was mainly beach trees in Fiordland and I had never heard of Willow Grubs in that area, but I still believed him - especially when he sent me the photos,of the flies in the trouts mouths. Maybe the fish were just being suicidal and eating any fly I thought to myself. It was only when I was on a four day camp out on a river in Fiordland just recently I figured out why! There was lots of small chartreuse caterpillars drifting down the feed lanes and the Chartreuse Willow Grub matched the hatch as they say! Perfect. Fish on! Another great thing I have learned this year! The learning never ends and I love it. 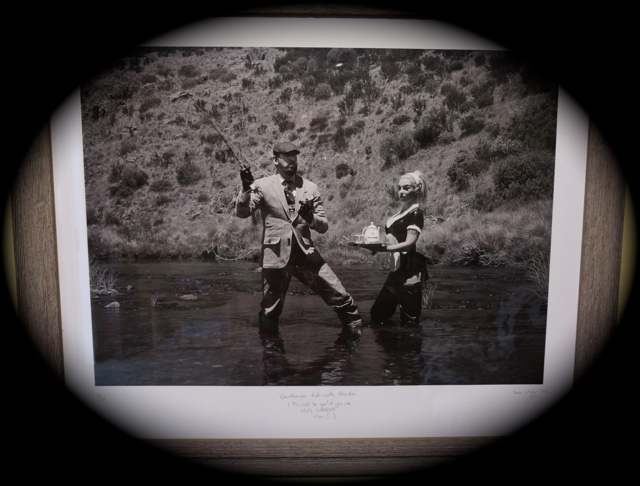 The photo-"Gentlemen Prefer Blondes" - Jesse's words on his awesome photographic art - remember send me an email, if you want to contact Jesse regarding buying a copy of the limited edition print - 4 left out of 10. A self portrait with a cheeky and ostentatious feel, an image purely driven by my own fantasy and love of all things ornate and excessive. 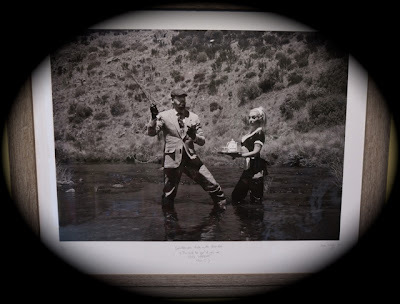 Fly fishing traditionally ruled by the elite and rich, and a sport so close to my heart since early childhood, I have tried to bring it inline with a more lowbrow and rock n roll lifestyle. A mixture of tweed and hot latex makes for humorous and fun feel. A boy can but day dream of a world dripping of Helmut Newton extravagance and desire. Black and white transforming an Australian alpine stream into the highlands of of Scotland and the elitism and ownership of fisheries that bars average men and women from fishing them. Unless of course they can afford to pay for the right to fish. Perhaps the extravagance and desire would not appeal so, if the beautiful streams I fish freely in Australia were suddenly privately owned and hired to only those who could afford them. 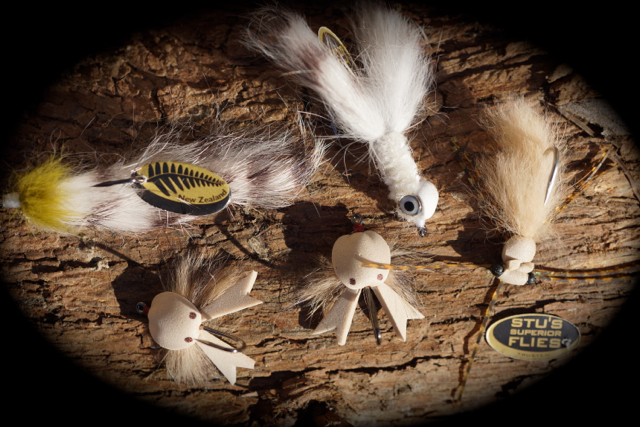 The barred Gimp - a Saltwater killer and a Carp slayer - fish it on the bottom - give it a twitch! Recently The Trout Diaries 50 min slideshow interview has been uploaded to Youtube so you can now listen and watch some cool photos at the same time. Click on the image below to watch and listen. SOME NEW SOUNDS - NOTHING TO DO WITH FLY FISHING - Feel the love! Thank you all for your AWESOME support and feedback.